As winter draws to a close we start to see subtle signs of spring inching closer in Gettysburg, Pennsylvania. The locals and frequent visitors of the area know exactly what to look for as spring draws near and Gettysburg prepares for a busy season of family fun, romantic adventures and solo travel. Check out these 10 signs of spring in Gettysburg! Battlefield bus tours and tours with a Licensed Battlefield Guide run year-round, but when the temps warm up you see some unique tours taking place on the battlefield. You can tour the battlefield by Segway, horseback, scooter, horse drawn carriage or bicycle, just to name a few. One of the most colorful signs of spring in Adams County are the gorgeous blossoms that fill the fruit trees this time of year. When the first apricot blossoms take bloom, you know it won’t be long until your palate will be filled with Adams County’s fresh fruit at every meal. Check out this list of places to admire springtime blossoms in Adams County! What would spring be in Gettysburg if this ripe and delicious produce wasn’t sold at the local farm markets? Check out the fruit stands and markets in the Adams County countryside, or shop right downtown on Thursdays and Saturdays at the Gettysburg Farmer’s Market or Adams County Farmers’ Market. When flowers begin to bloom in the center of Lincoln Square, and you see hanging baskets and planters lining the streets of Downtown Gettysburg, you know spring has arrived. The Gettysburg Garden Club does a beautiful job of brightening up Lincoln Square for the season. Although there are some adventurous souls out there who golf even in the coldest months, many more venture out to Gettysburg’s golf courses in the spring. As our courses fill up with golfers ready to dust off their clubs for the season, it’s a sure sign that spring is upon us. Nothing screams warm weather quite like a scoop of a creamy cold treat from your favorite Gettysburg ice cream shop. When our ice cream shops reopen for the season, we can all get excited for the warm sunny days to follow! When spring arrives, you’ll see soldiers from both the north and south converged under big white tents at Gettysburg National Military Park. Head to Spangler’s Spring, Pitzer Woods, or the Pennsylvania Memorial to learn about the battle and life as a soldier with demonstrations and engaging living history presentations. Or check out the Gettysburg Heritage Center Museum’s complimentary living history encampments throughout the season. Some of Gettysburg’s most popular museums open their doors again at the start of spring, prepared to welcome in visitors from all over the country, and even the world. Whether you’re interested in civilian stories, Civil War artifacts or dioramas – you can experience it all in Gettysburg! Gettysburg has such a quaint downtown and amazing historic views, who wouldn’t want to enjoy a meal outside when visiting? As area restaurants begin to bring out tables and chairs, everyone knows that the weather has taken a turn and temperatures are rising! Check out this list of places to dine outside in Gettysburg. A field trip to Gettysburg is an incredible experience for student groups who are learning about the events that took place on these hallowed grounds. And spring is one of the busiest times of year for student travel! When you begin to see bus upon bus full of students exploring the battlefield, it’s safe to say spring has arrived. 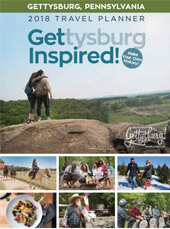 Download the My Gettysburg app and start planning your spring adventure! Mix in some history and recreation with agriculture and culinary experiences for the perfect getaway.